The chairman of the Peoples Democratic Party (PDP) in Abia State, Chidi Nwosu, alongside almost all his executive members, yesterday officially defected to the All Progressives Congress (APC). He said the step was necessary because his former party was comatose with several unsolvable conflicts of interest. Nwosu declared his membership for the APC during a stakeholders’ meeting held at the state secretariat of his new party in Umuahia, Abia State capital. 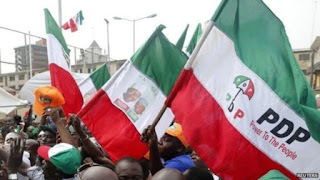 He said he had completed his registration process from the ward to the state level, adding that he was prompted to join the APC as a result of division in the PDP. Nwosu said with the current efforts of the APC-led federal government in ensuring the growth and development of the country, he had no choice than to declare for the ruling party. Meanwhile, the former governor of Abia State, Dr. Orji Uzor Kalu, has challenged members of the APC and those wishing to join the party in the South East, to work together and win various positions. “Those who want to join me to APC you are welcome; those who don’t want to still remain my friends. My commitment is to God, the people and to democracy,” he said.